Cars are stopped at a red light. The cyclist pulls up and stops next to the first car in line at the light. The driver of the car does not see the cyclist. The light turns green. The cyclist goes straight and the car makes a right hand turn. The car may or may not have a right blinker on. Do not pull into the blind spot of the car - in other words, don't stop right next to the car. 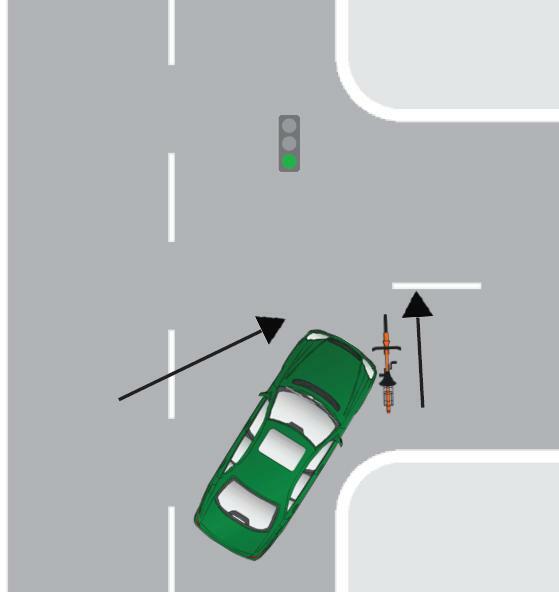 Stopping behind the first car instead allows the driver of the car to see you and also allows the cyclist to follow behind and be out of the way of the car when it makes the right turn. Pull to the front of the car. The other option is to ride far enough in front of the first car that they can see you through their windshield. This scenario is much more difficult than the others. Some of the decision will depend on the specific facts of the accident, such as did the car have its blinker on, was the cyclist in the blind spot of the car, was the driver being attentive, etc. It is still likely that the car would be found to be negligent. HOWEVER, this scenario creates much more argument that the cyclist was negligent. If the cyclist pulls into the blind spot of a car that has its right blinker on then I think it makes it hard for the decision-maker to determine that the cyclist was not contributorily negligent. Remember, that some negligence on the cyclist part in Virginia means that he cannot recover for his injuries. A jury or a judge makes the ultimate determination of whether the car was negligent and whether the cyclist was contributorily negligent.